Info Debbie Wasserman Schultz is the oldest child of Lawrence and Ann Wasserman, and was born on September 27th, 1966 on Long Island, NY. Debbie attended the University of Florida and graduated with a Bachelors Degree in Political Science in 1988 and with a Masters Degree in 1990. She was elected to the Florida State Senate in 2000 and was reelected in 2002 to a four year term, representing the 34th District. 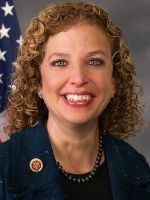 Senator Debbie Wasserman Schultz was first elected to public office in 1992 when she was elected to the Florida House of Representatives at the age of 26. She has the distinction of being the youngest woman ever elected to the Florida Legislature. In her first race, she won with 53% of the vote in a six-way Democratic primary after only residing in Broward County for three years. She bested opponents who were life-long residents of Broward and who significantly outspent her. She has had an opponent every election cycle except one and has received more than 60% of the vote in each election since her first primary victory. In 2000, Senator Wasserman Schultz was elected to the State Senate, where she currently serves the people of Broward and Miami-Dade Counties. She served in the Florida House of Representatives from 1992-2000. Senator Wasserman Schultz's service in the House included a term as House Democratic Leader Pro Tempore, House Democratic Floor Leader and Chair of the Broward Legislative Delegation. She chaired the House Committee on Higher Education from 1994-1996. Education, children's issues, insurance law, and gender equity have been the major focus of her personal legislative agenda. Senator Wasserman Schultz currently represents 400,000 residents of Broward and Miami-Dade Counties. The Congressional District includes the entire Broward portion of her Senate seat, and contains large portions of her former House seat. Having held both of these seats, Senator Wasserman Schultz has represented 75% of the Congressional District over the past 11 years. The Senator has been involved in countless projects which have benefited Floridians locally and statewide. Two items which recently became law and are extremely important to protecting our youngest residents include her bill that required a referendum (which was successful) to create a Children's Services Council for Broward County, as well as the Florida Residential Swimming Pool Safety Act, designed to prevent toddlers from accidental drowning. The Senator serves on the Board of Directors of numerous organizations, including: the American Jewish Congress, Southeast Region; the National Jewish Democratic Council; and the National Safety Council, South Florida Chapter. She was a former board member for Planned Parenthood of Broward and South Palm Beach Counties; and the Westside Regional Medical Center. She also is a member of many local organizations such as; the National Women's Political Caucus, Gwen Cherry Chapter; the American Jewish Committee; National Council of Jewish Women; Hadassah; and the Miramar/Pembroke Pines and Weston Chambers of Commerce. She has been married to Steve Schultz for 13 years and together they have three children: Jake and Rebecca (twins) who are four years old, and the new addition to the family, daughter Shelby, born on August 10th, 2003. 08/25/2020 FL District 23 - D Primary ?? ?